Are you planning on putting it on your boat deck using a davit - or just towing it? I owned a 12 ft Carolina Skiff many years ago. It was very stable which my wife enjoyed. It wasn't fancy so I didn't worry too much about beating it up. It would carry a big load. If you can handle the weight, I think it would be an excellent dinghy. Can't comment on the Livingston. The livingston will give you a much drier and smoother ride, but not as fast as the Carolina skiff. The Carolina will pound in a chop and give a wetter ride, but faster than the livingston. More likely to be able to plane off a heavier load with 15hp in the Carolina. I have owned both a Carolina Skiff and a Twin Vee (1st cousin to the Livingston). We have a 12' livingston with a 20hp on it. Top speed with just me is about 20 kts. With 4 people, it's about 17. It won't get on plane with 4 big people. It can be wet if the weight is distributed poorly. I would say they are much more rough water capable than a12'Carolina skiff. Stability seems about the same. We're really happy with ours. Overall it seems to be a lot more boat than 12'. I'm surprised the weights are advertised as the same. Have 9ft Livingtston with an 8hp two-stroke. Planes easily with two aboard. Tops out at ~18 with me alone. Can be wet in certain conditions. TONS of room! FWIW, we bought an 11-foot Bluewater Baby for our 44 Defever from the previous owner of the company. A bit heavier at 300+ pounds and not cheap, but we like to fish and need the room. If the 12-foot Carolina Skiff is the older flat bottomed CS hull, prepare for a pounding in anything but flat calm. We had a larger version that rattled my teeth. The newer DLV cathedral hull (we have a 19) is a much smoother ride. What kind of davits are you thinking of ? Kinda of in the same situation. You actually would have tons of room if it was a flat bottomed boat w/o that cat tunnel stick'in up in the ctr of the boat. Tons more capacity too. Be sure to get the beefier Livingston, designed for Davits, gunnels are built stronger.. I never did like the center tunnel in mine, but it was a decent boat. Wife always liked the overhang on the bow, could hook it over the dock, and it made a very stable boat for getting on and off. I have the 9ft Livingston with an 8hp Yamaha. I carry it like shown by Boathealer in post #7. A friend has the 12ft Livingston with either a 20HP or 25HP and it is the go to boat if there is more than a 2' chop. or if we are going any great distance which has been done. It can reasonably carry 6 people and 8 in a squeeze. Have not seen the Carolina but I have seen the others in the 8-9ft range that were flatter bottomed. They were faster than mine but rougher if any chop. Yes, the tunnel reduces interior room but it is also what smooths the ride out. Not perfect but a good compromise, at least to me. And I suspect almost all these small boats are going to be wet if the chop is enough. 30+ years ago we had a 9' livingston that was well built and suitable for our young family. Fast forward to 2013 when we bought Blue Sky and needed a new dinghy. Because of our previous success with the 9' we decided to again go with a Livingston but the 10' model which has a much higher capacity rating. We also went with their recommended combo of the Yamaha 9.9 4 stroke and 7' oars. First off, the 7' oars were way too short; 9' oars worked perfectly after two 80 km trips to get the right ones. We also installed a Seawise davit system, again recommended by Livingston. 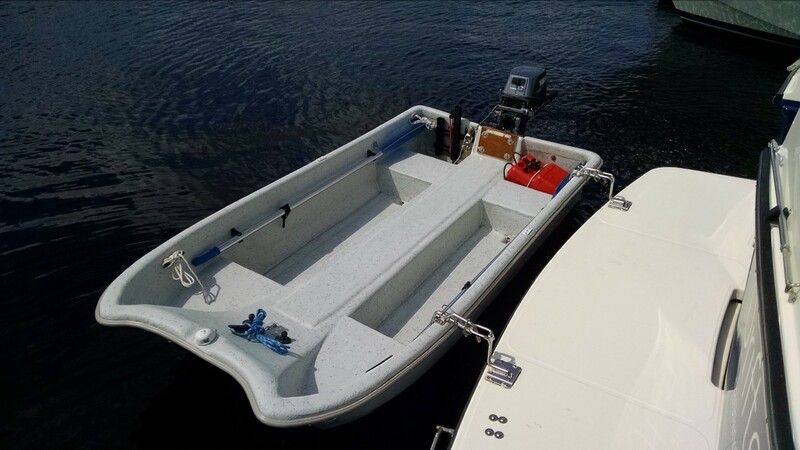 The Seawise system did not fit, and we had to significantly modify the dinghy transom. After everything was finally setup, the dinghy only planes with two light people on board; anything more and the prop cavitates. Oh, and the dinghy arrived damaged because the shipping crate from the manufacturer wasn't properly designed. All of the above to say that current Livingstons are not built or marketed like they used to be. I was told by a Livingston rep in 2013 that the company has been through 5 ownership changes since we first bought our 9'. How is the ride compared to a Boston Whaler? Ours is sitting in my garage and has not been used yet. We need to reinforce the davit before it goes on the big boat. I hope to try it out in the river later this fall and will post my impressions. I've been told the ride is less jarring than a Whaler. We're very pleased with the roominess and layout. Consider a tinny, lighter than solid glass. Get a beamy one and they can be very stable.